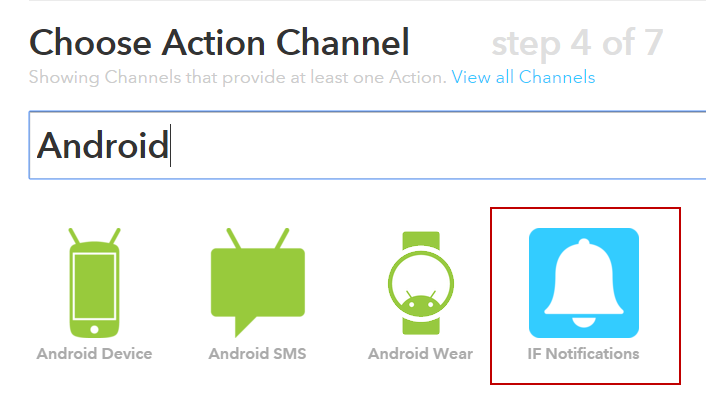 Note: IFTTT has changed its interface and approach to setting up applets and integration with services. This guide is no longer accurate. The Funnel Cake (0.8) release of the Nightscout site code brings IFTTT integration to Nightscout users. IFTTT is an extensible system by which users can create custom recipes following an “if this then that” logic. Nightscout users can use IFTT in response to Nightscout “events” (like a high or low warning, a Care Portal treatment entry, a site announcement, etc.). The potential of the IFTTT system is exciting, and users can create their own recipes using any available IFTTT channel in combination with the Maker channel. Possible applications of IFTTT integration range from sending an SMS message or phone notification when a Nightscout event happens, to tweeting a Nightscout event, to changing the color of household lights based on a Nightscout event (if you use a smart lighting system like Philips hue). After you have an account, you need to find your Maker key. 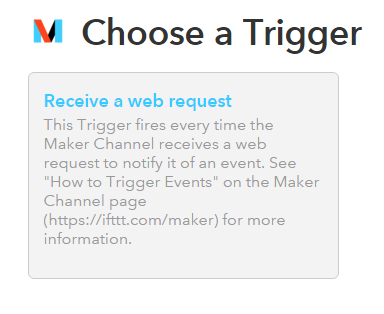 This is shown on the Maker channel page when you are logged in. After you have added your Maker key to your site configuration and ENBALED maker, you can create a recipe. As noted above, each user may find different ways to take advantage of IFTTT integration. 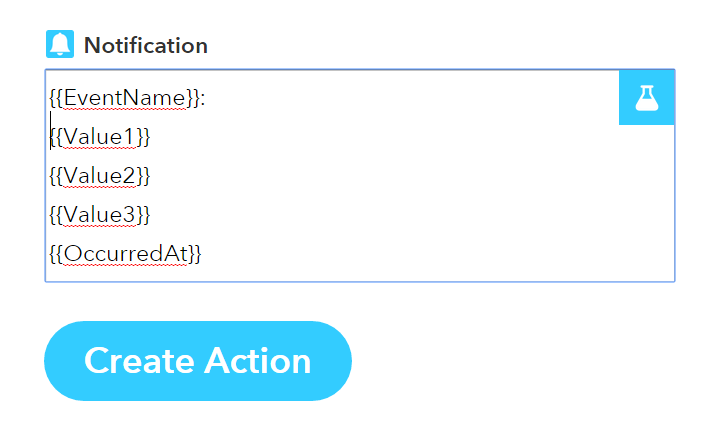 To understand the process of creating a recipe, we will use setting IFTTT up to send a notification to your cellphone (iOS in this example) to demonstrate the process. Choose to “Create a Recipe” by going to My Recipes / Create a Recipe. First you have to identify the THIS part of the “if this, then that” statement. Click the large blue underlined THIS to start the process. 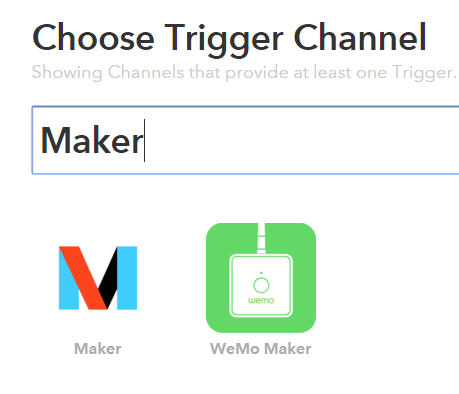 Type “Maker” into the “Choose Trigger Channel” search box. Click the trigger (the box) shown. 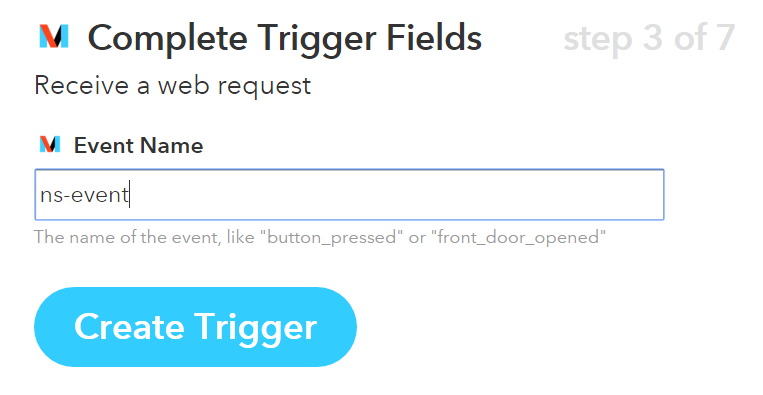 (In this example, “Receive a web request” is the trigger. Click the large blue underlined THAT to set up the second half of the recipe. You can now choose from any available action channel. 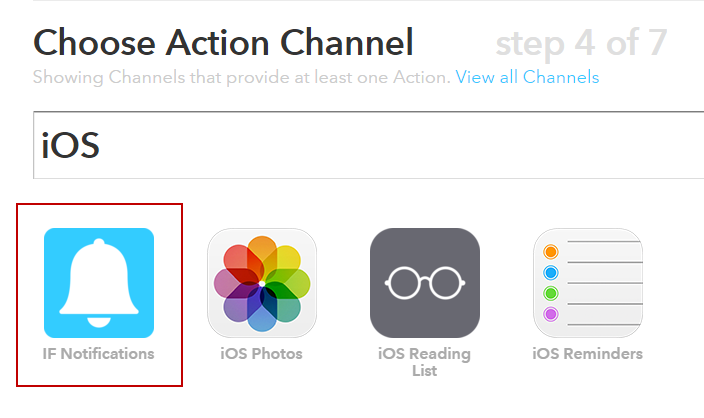 (Note: You may have to do additional steps to set up or configure a channel for use, including installing the IFTTT app on your cellphone and activating it.) For this example, enter “iOS” or “Android” in the search box. For either iOS or Android, click the IF Notifications icon (shown in a red box in the images above). The default notification text will be shown. 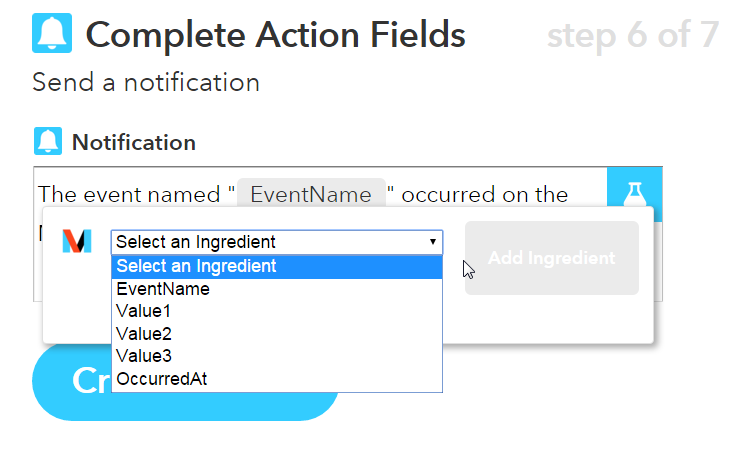 You can add additional information to the notification by clicking the “beaker” icon to the right, and then clicking the dropdown menu for “Select an ingredient.” Any or all of the available ingredients can be added to the notification text (one by one). The recipe then appears in your “My Recipes” area. You can edit it from this location at any point. To see steps for creating a recipe that sends a tweet, click here. ns-event – This event is sent to the maker service for all alarms and notifications. This is good catch all event for general logging. ns-allclear – This event is sent to the maker service when an alarm has been acknowledged or when the server starts up without triggering any alarms. For example, you could use this event to turn a light to green. ns-info – Plugins that generate notifications at the info level will cause this event to also be triggered. It will be sent in addition to ns-event. ns-warning – Alarms at the warning level with cause this event to also be triggered. It will be sent in addition to ns-event. ns-urgent – Alarms at the urgent level with cause this event to also be triggered. It will be sent in addition to ns-event. ns-warning-high – Alarms at the warning level with cause this event to also be triggered. It will be sent in addition tons-event and ns-warning. ns-urgent-high – Alarms at the urgent level with cause this event to also be triggered. It will be sent in addition tons-event and ns-urgent. ns-warning-low – Alarms at the warning level with cause this event to also be triggered. It will be sent in addition tons-event and ns-warning. ns-urgent-low – Alarms at the urgent level with cause this event to also be triggered. It will be sent in addition to ns-event and ns-urgent. ns-info-treatmentnotify – When a treatment is entered into the care portal this event is triggered. It will be sent in addition to ns-event and ns-info. ns-warning-bwp – When the BWP plugin generates a warning alarm. It will be sent in addition to ns-event and ns-warning. ns-urgent-bwp – When the BWP plugin generates an urgent alarm. It will be sent in addition to ns-event and ns-urgent. You also have the ability to set up a second stream in Funnel Cake by setting a MAKER_ANNOUNCEMENT_KEY variable in your site settings. 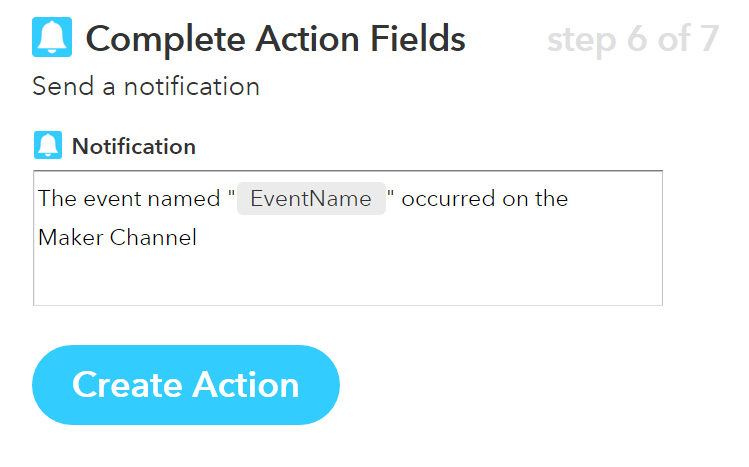 Any keys you add in the value for that variable will receive site-wide announcements, another new feature in Funnel Cake. One important thing to understand about IFTTT is that recipes you create are specific to your IFTTT account. You can’t, for example, create a recipe to send a notification to a different caregiver’s phone. That caregiver would have to also have an IFTTT account, a maker key, and individual recipes, and that caregiver’s maker key would need to be added to the Nightscout site settings. Please be sure and test your recipes. You may notice that there is a delay with notifications and SMS messages (or other IFTTT actions) in response to Nightscout events. IFTTT actions may arrive later (or slower) than Pushover notifications. Unlike Pushover notifications, you do not need to “clear” or “acknowledge” IFTTT notifications.